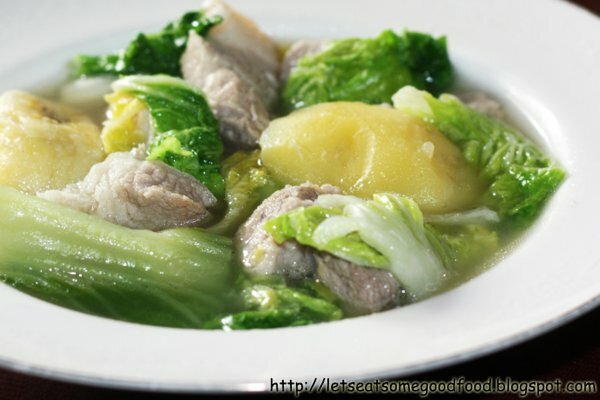 One of easiest recipes I learned to cook was the Pork Nilaga (Boiled Pork). It is one of the good food being cooked anywhere in the Philippines. Yesterday had me craving for it so I cooked it for my partner and kid. I am glad my baby liked it, although I only fed him a piece of the potato and soup. I am in the mood of sharing my favorite food so I will let you in my 'secret' recipe(smile). Serves 4-6 persons and takes 45 minutes -1 hour to prepare. Place pork with 2 liters of water and boil. Once boiling, put in the onions, ginger, tomatoes, and leave it for 30 minutes until the meat is tender. Add the lemon grass, and potatoes. Add salt to taste. Add Chinese pechay and cook it for about 3 minutes. Good to eat when the weather is cold. Heaven.